According to the detailed tanker report just published by Sun Shipbuilding and Dry Dock Company, the world tanker fleet continued to grow in 1976 with a 9.6 percent increase in capacity over the previous year. This annual study, "The Analysis of World Tank Ship Fleet," shows that this increase, the smallest in the last nine years, raised the world fleet to a record 5,140 tank ships with a 382.5-million-deadweight-ton (dwt) capacity by the end of 1976. The tankers operating under the Liberian flag maintained their world leadership with 112.9 million dwt, followed by Japan, United Kingdom, Norway and Greece. Among the leading nations, the United States-flag tanker fleet was in the eighth position. With the exception of United Kingdom, all leading nations showed increases under their flag in spite of the accelerated retirement of older tankers during the last two years. Again, Liberia showed the largest increase, with 11 million deadweight tons, followed by Japan, with an addition of almost 3 million tons to her flag fleet. The continued scrappage of the older ships decreased the average age of the world fleet to six years and four months by the end of 1976. Sharp increases in fuel costs since 1973 justified the building of larger and slower tankers. By the end of 1976, recent new shipbuilding had increased the average tanker size to 74,400 dwt, and decreased the speed to 15.7 knots from 15.8 knots of the early 1970s. As a result of the continued large tanker layups and pessimistic tanker demand forecasts, construction contracts showed an even sharper decline in 1976 than they did the previous year. Tank- ers under construction contracts or on order totaled 52 million dwt, the lowest tanker orderbook since 1968. More than 23 percent of the newbuilding was contracted by the largest shipbuilder of the last decade, Japan, followed by United States, Sweden, Spain and United Kingdom. An added feature of the current edition of the Sun Shipbuilding publication is a discussion of the basic aspects of modern tankships, their functional design and typical cargo characteristics. It shows in simple terms the results of the tanker evolution that followed the exploding growth of the trade of liquid fuels. "The Analysis of World Tank Ship Fleet, December 31, 1976," is the 35th edition of the annual Sun Shipbuilding and Dry Dock publication. 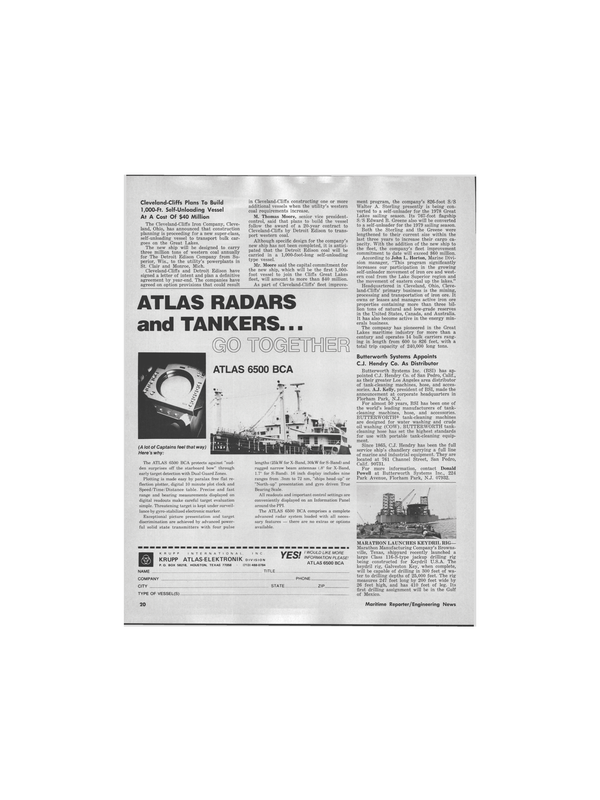 It is available for $15 per copy from Tanker Fleet Analysis, Sun Shipbuilding and Dry Dock Company, P. O. Box 86, Chester, Pa. 19013.